After a winter of cabin fever, we burst outside in summer. Morning coffee on the deck. Sweetcorn suppers on the porch. A glass of wine with the neighbors under the stars. There’s only one tiny little issue and after the rotten winter we just had I hate to even mention it. But, there are these Wisconsin summer days when the air does not move. It lays on us like a damp blanket, all stuffy and sticky. That air is so heavy the maestro chides us gently to be extra quiet at Madison’s Concerts on the Square because it’s hard to push the music through that air. It’s real, it’s heavy, and it threatens to spoil summer for us. But there is a simple solution to moving that hot sticky air at home. A damp-rated or wet-rated ceiling fan. It’s a crazy good product that has changed the way we live. 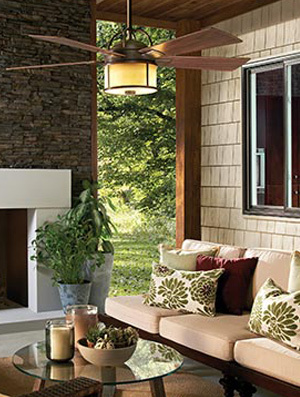 A damp-rated fan works on the porch where it doesn’t take a direct blast of rainwater or snow. Built of quality materials the damp air doesn’t ruin its electrical components. The heat and humidity? Not a problem! Want to take it outside? A wet-rated ceiling fan can hang under an arbor, in a gazebo, or anyplace you can run a wire to overhead. Seriously. Outside. You can hose them off. Sealed moisture-resistant motors, rust-resistant housing, stainless steel hardware, and all-weather blades mean you’ll be enjoying coffee on the deck for many summers. The thing about these fans is it is important to get one that’s well built, with quality parts, and rated for the use you are planning. Why? This air is heavy. And if you want relief from that you’ll need a motor that can move air. Big box stores offer little help, so come and see us at Madison Lighting. We are experts at helping customers understand the motor essentials. You’ll want the blade length that’s optimal for your space and dining table. You’ll want it to be quiet so you can enjoy the birds in the morning and the night sounds each evening. Plan for your fan? It pays off with years of enjoyment. Enjoy your summer!